Benefit: The ten gallons of additional capacity allows you to pump all of the product out of a 55 gallon drum and into the system before the overhead container is empty. This reduces the downtime of employees changing drum pumps.This also allows you to send drums back on the delivery truck so you do not have to pay any drum deposits. Benefit: This feature makes inventory control much easier. You will save money by not needing extra product as stand by. You will also have no more down time due to product shortage created by poor inventory management. Benefit: This eliminates product contamination that you can get by having a drum sit on end with a small plug out to provide a vent. Benefit: Employees can easily draw the correct product for their machine which reduces the chance of the wrong product being used and causing machine down time and repair. Benefit: The self priming pump saves time and clears all lines of product except for a light film of oil which makes cleanup time short and easy. The pump and suction tube vacuums all of the product out of the drum as opposed to drum pumps that can leave 2-5 gallons of product in the bottom. Benefit: By using the timer that is installed on the motor and pump, employees can set the timer to shut off the motor when the 55 gallon drum is empty. This leaves employees free to do other productive tasks. Benefit: The drip pan catches any spills and provides a space to store any oily cans. This makes the lube storage area cleaner and safer. Benefit: This ensures that employees will not mistakenly leave a faucet partially open. Benefit: The faucets ensure smooth, consistent controllable flow of product into containers. It keeps employees and the storage area cleaner. Benefit: The racking utilized in an IFH Oil System is never loaded to more than 85% of its rated capacity.This assures safety and years of dependable service. Benefit: As your business grows and you need more products, extra containers, racking and valves can be added to an existing system cost effectively. Benefit: The pre-assembled modules allow a short setup time. The dispensing manifold, drip pan, pump, motor and timer are all assembled and tested at the factory so it only takes 2 employees 2 ½ hours or less to assemble the system. Benefit: An 8 container system requires only 25 square feet. That replaces 9- 55 gallon drums on the floor which requires 120 square feet. That benefits you by freeing up 95 square feet of storage space that could be used for extra storage space or manufacturing. 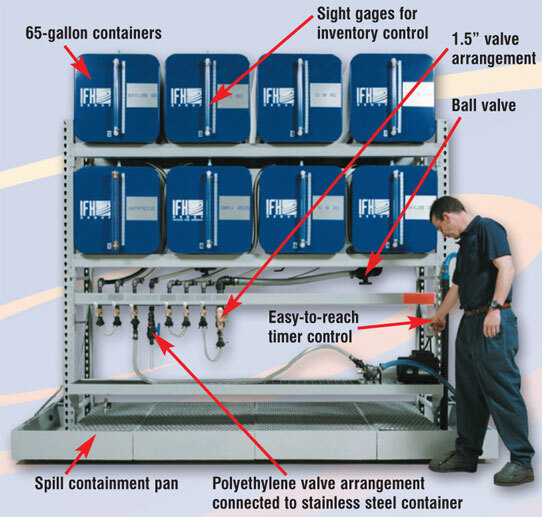 Benefit: Many variations of IFH Oil Systems assure you a system that fits perfectly into your industrial environment. Benefit: The IFH Group has custom designed many systems to meet the specific needs of customers across the globe, and the benefit is that a custom designed system will probably not cost you much more than a standard model. Benefit: The containers, racking, PVC hose, flex-steel hose, and drip pans are warranted for 5 years. Electric motors are warranted 1 year and the pump for 90 days. To you this means no out of pocket repair costs except for normal wear and tear. Benefit: Mobile lube carts, special products packages, hose reels, air pumps, and totalizing meters all can be added to the system that will increase the efficiency of the system and your employees.